Last night my husband was talking brewing with the gentleman next to him at the bar. After they had been talking for a few minutes the gentleman’s wife asked me, “what do you do while he brews?” I replied that I write. We struck up a great conversation about reading/writing/general creative-ness. This morning, going through some pictures, I ran across the one above and had to smile, because it so accurately sums up the previous evening’s conversation. I love beer. I love checking in on the boiling pot of sweet-smelling wort. I get excited when the resting beer starts to emit tiny bubbles signaling the beginning of fermentation. And of course, I love all the sampling. 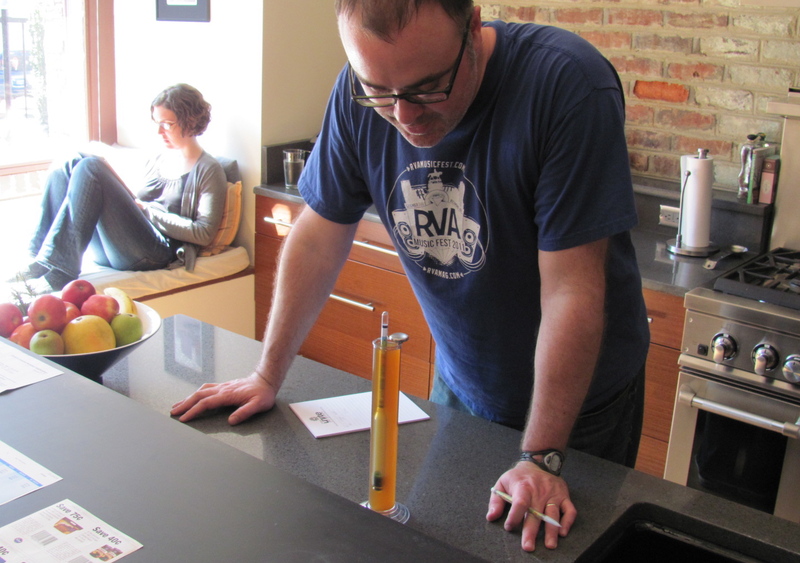 Above all, I love my husband and am proud of each and every beer he makes. I have no desire to brew beer. Similarly, my husband gets as excited about views and likes and comments on my blog as I do. He understands completely when I need to stop in the middle of dinner to jot an idea down in my little writer’s notebook before it escapes me. He’s helped me with query letters and proofread countless blog posts. And yet, he has no desire to be a writer. Obviously shared hobbies are immensely important too, but I think even those are enriched by individual interests. For example, travelling is one of our shared hobbies. Our most recent trips were to England where we visited Stratford-upon-Avon and the pub where J.R.R Tolkien and C.S. Lewis’ writers group met (quite writer-ly) and to Denver, CO for the Great American Beer Festival (quite brewer-ly). So today we’re celebrating the holiday with a quiet morning of writing and an evening spent raising a pint of craft beer. Happy Independence Day! This entry was posted in Eating & Drinking, Living & Loving, Reading & Writing and tagged brewing, independence, writing by marychrisescobar. Bookmark the permalink.